Hello. So as you could already imagine I have massive FPS issues. I play with everything on low 720p and I get 20fps.. I have a GeForce GT 1030 Intel Core i5-2400 8GB RAM DDR3 Please help me! Looking for help! OBS Settings? Hiya people! Just have a little question directed at anybody who records ETS2 MP with OBS... what are your settings? OBS for me works fine for a bunch of other games I play, but just seems to hate this game now. It doesn't lag when I'm in the menu screen but as soon as I go to drive or do anything in the game, my FPS in the recording just dies, while my FPS while I'm actually playing is totally fine and not stuttering at all. It started happening maybe a month ago, and I just haven't been able to figure out why it's doing this or how to fix it. So I thought I'd ask here! Any help is appreciated, so long as what you've tried or done actually works! Hello, I am using my friends account to post on this forum. I am currently having issues signing up for an account on the website. I have bought Euro Truck simulator 2 and i have played for more than 2 hours and I am still having issues signing up. Help would be very much appreciated Thank You. Witam, Nie wiem gdzie napisać ale mam pewny problem z etsem, podczas gdy włączam całą grę. Po czym mam taki otóż komunikat. Hello. I come to you asking how to repair the error that in any company I can not take orders and if I manage to take it, I write that your client expects delivery any moment and then I do not get any money ... please help me quickly! Hey everyone! 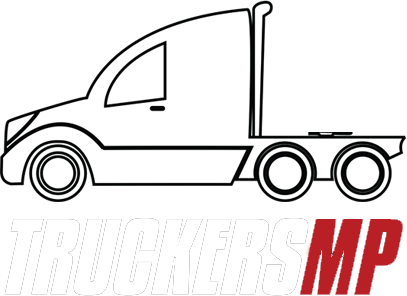 I'm new to the AMT game and truckersMP. So i just got myself online about an hour ago, and i went to do my first run. I chose my job from the quick job menu as I didnt own my own truck yet. I picked a longer haul worth about 19k. Got on the road, didnt need to stop for a rest for some reason even though the run was over 7hrs, i didnt get sleepy at all. (not sure if that feature is removed here or not. no biggy either way.) Got to the drop off, backed myself in for maximum XP. and completed the job. I was watching the cash roll in when i noticed that at the top of the summary it said LATE. And then i looked at the time for the run and it said that it took 173,000 hours. obviously this is a mistake. but a costly one, i lost a rank and about 25k cause i had to pay for the late delivery. is this common? im kinda at a loss here. I can't play ETS2MP due to an unknown authentication error. Help! Hi all. I tried logging on to truckersmp as usual but the server took an awfully long time to log me in before displaying a message saying "unknown authentication error. server couldn't connect to api truckersmp port 443. timed out". While this is not the first time this has happened to me. It seems to be a thorn in the side to solve this time round. Anyone experiencing the same issue? I would like to ask what the role of external missions, and why the limit of 90 km / h, I would like to ask whether this limit can be lifted. Пишіть свої проблеми тут. Якщо ви знаєте як вирішити чиюсь проблему-напишіть як. Якщо вам допомогли-не жалійте лайки. From no where i get this red text and getting kicked. Whats wrong?